CHAPEL HILL – Chapel Hill-Carrboro City Schools leaders said Monday that a decision must be made by February 1 about how to reduce overcrowding at Glenwood Elementary School. That leaves the Board of Education with limited time to evaluate several controversial options, such as spot redistricting or halting the expansion of the school’s Mandarin Dual-Language Program. Glenwood’s capacity is 423 students, but enrollment this semester is 513. “And it is as simple as there aren’t enough seats at Glenwood Elementary School making it so some students will have to move,” CHCCS Superintendent Tom Forcella said, adding that the district would try to avoid relocating as many students as possible. This overcrowding, Forcella explained, was due to several factors including an unanticipated number of students who moved into the Glenwood district and also an unexpected increase in enrollment in the Mandarin-Dual Language Program, which is projected to significantly increase in size over the next five years. The CHCCS Board supported the expansion of the dual-language program at Glenwood Elementary in the past, but now that the school is above capacity and will continue to grow, district leaders at an impasse, and many parents are concerned over the suggested solutions. A decision must be made before Feb. 1 when parents enroll their children in kindergarten. The suggested solutions include spot redistricting, relocating the Mandarin Dual-Language Program to another school, delaying the expansion of the program, or the creation of either a Mandarin Immersion Magnet School, or a combined Spanish/Mandarin Magnet School. If any spot redistricting were to happen, it wouldn’t be until the fall of 2014. Although no school has been named as a potential site for a new magnet school, Carrboro parents have said at previous CHCCS Board meetings that they fear the plan to combine Mandarin and Spanish dual-language classrooms together at one magnet school would pull apart Carrboro Elementary. Currently half the school’s students are enrolled in the Spanish dual-language program. “It’s just about the disruption of many, many kids versus expansion for very few,” said Mary Faith Mount-Cors, the parent of a third grader at Carrboro Elementary School. 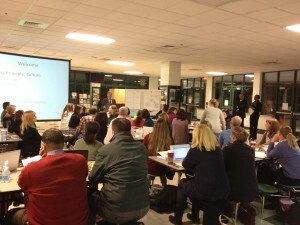 Mount-Cors participated in a new style of meeting Monday night, hosted by the district, called a “Focused Dialogue” session. Parents, elementary school principals, PTA members and other community members conducted table group discussions about how the district should address the Glenwood overcrowding issue. Those who weren’t sitting at the work tables could submit their comments online. Though she wasn’t happy about the possible shake-ups that could be coming to Carrboro Elementary, Mount-Cors said that she did find Monday night’s process and discussions to be helpful. Susan Swofford, parent of a fourth grader in Mandarin Dual-Language program at Glenwood Elementary, watched as the work tables discussed the options. She said she wasn’t pleased with the way the district accounted for growth in the program. “The district has done a good job in making long-term plans with the Spanish [Dual-Language] Program but they more or less have dragged their feet in doing that with the Mandarin [Dual-Language] Program,” Swofford said. Assistant Superintendent Todd LoFrese said the district doesn’t want to move children that were just affected by the recent redistricting. He also said district leaders do not intend to neglect the Mandarin Dual-Language program. LoFrese added that spot redistricting would likely result in a high percentage of economically disadvantaged students in non-dual language tracks. Discussions about enrollment levels at Glenwood Elementary School are slated to return to the CHCCS Board Education in January.